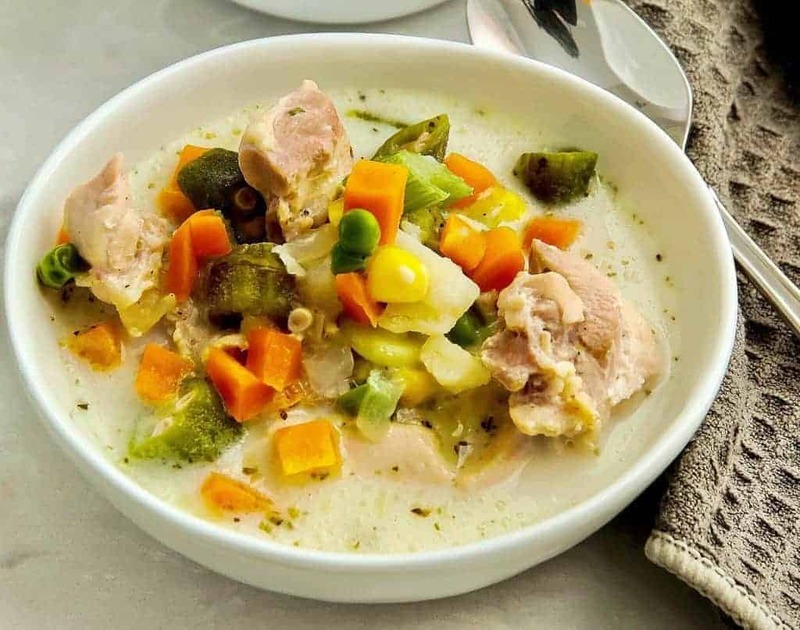 Here’s a super easy, delicious and highly customizable creamy chicken soup recipe for your pressure cooker or instant pot that you can make with whatever you have in your pantry, freezer, or fridge. I’ve been making this Creamy Chicken Soup in my pressure cooker since my kids were little. I also call it my “Whatever you have in the freezer” soup. Or my “I can’t be bothered soup”. Or, “How can this taste so good each time?” soup. I make it differently each time and I’m going to list some variations in how I’ve made this but the one thing all the variations have in common? Delicious. Actually two things in common, maybe four. Delicious. Easy. Creamy. Cheap, because you can use whatever you have lying around without having to make a special trip to the store for ingredients. 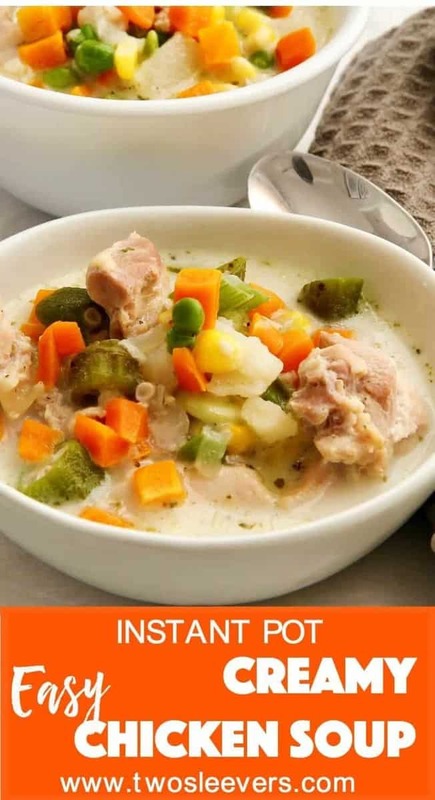 The only things you need are chicken, some kind of frozen vegetables, some kind of seasoning, and either evaporated milk, or half and half, or cream to add to it. Think of this as a “base soup” recipe that you can customize to your heart’s content, and give it your own flair. Here are some other ways I make this soup. So see? You could use WHATEVER you have lying around and have a pretty great soup in just a few minutes. I’d love to hear your variations on this soup once you’ve tried it. 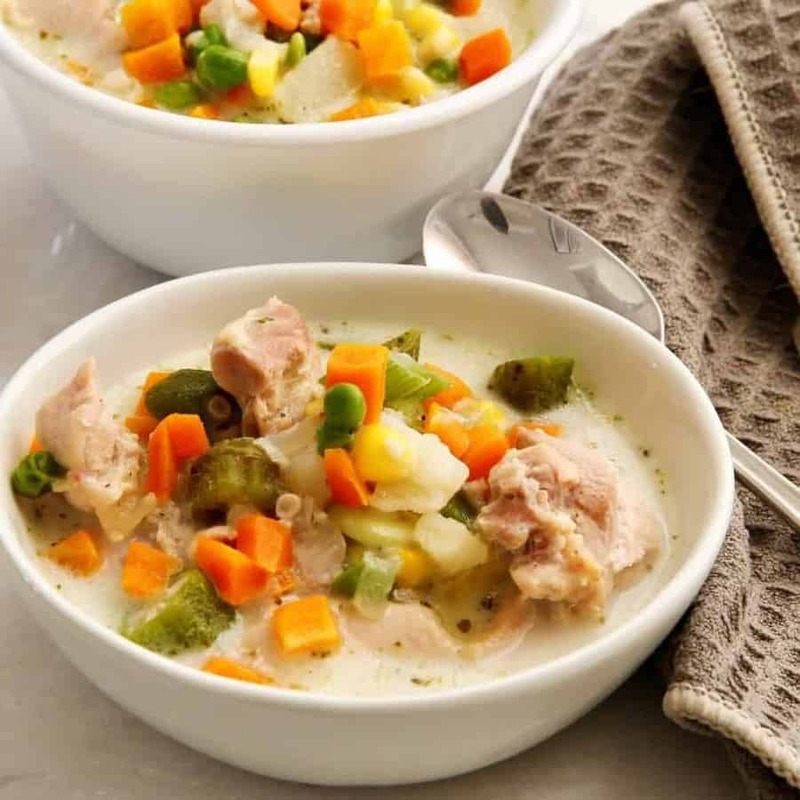 Here's a super easy, delicious and highly customizable creamy chicken soup recipe for your pressure cooker or instant pot that you can make with whatever you have in your pantry, freezer, or fridge. Place all ingredients except the evaporated milk into the inner liner of your Instant Pot or pressure cooker. Cook for 2 minutes on high pressure and release pressure immediately, being careful to do this in short bursts so as to not get soup all over your kitchen. Add in the evaporated milk, stir, and serve. I sometimes mash up the chicken with the back of a wooden spoon to break up the chicken into shreds but this is of course, entirely optional. Also, fiddly. You can also make this with leftover cooked chicken. In that case, reduce cook time to 1 minute at high pressure. You can use chicken thighs, chicken breasts, etc. as long as the meat is diced into small pieces so it cooks in the same time as the vegetables. If you want to use fresh vegetables, you will have to substitute cooked chicken, and reduce time to 1 minute at high pressure. Cooked chicken + fresh vegetables = 1 minute high pressure. Raw, diced chicken + frozen vegetables = 2 minutes high pressure. Look in the body of the post for other mix and match combinations of vegetables and flavors to make this soup your own variation. I love how versatile this creamy chicken soup recipe is as I can use what I have on hand to make it. Thanks for sharing this amazing recipe!